Panasonic and Tesla, the electric car company, have finalized a supply agreement for lithium-ion battery cells to be used in Tesla's new electric sedan, the Model S. The automotive-grade lithium-ion battery cells will be provided by Panasonic, which is the world’s leading battery cell manufacturer. The agreement supplies Tesla with Panasonic’s lithium-ion battery cells to enable it to continue the companies innovative design and production of electric vehicles. Panasonic guarantees enough cells will be available in 2012 to meet Tesla's impressive future production plans of more than 80,000 vehicles over the next four years. The Model S already has 6,000 reservations, and this agreement will help meet those orders. 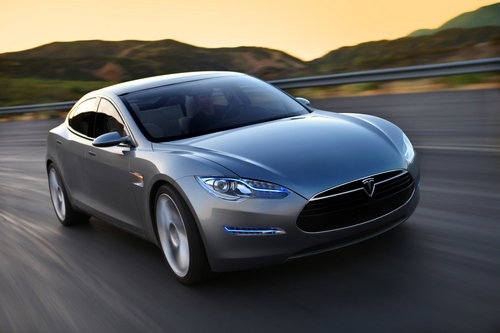 This also ensures that Tesla will be able to meet the cost and margin targets for the Model S electric sedan. The two companies have already had a multi-year collaboration, and this agreement only continues and strengthens that bond. In 2009, Panasonic and Tesla initially entered into a supply agreement for supplying automotive lithium-ion batteries. In 2010, Panasonic invested $30 million in Tesla to foster the growth of the electric vehicle industry. This relationship will continue growing the electric vehicle market. Panasonic supplies and builds battery cells with the highest energy density and industry-leading performance using its nickel-type cathode technology. Working in collaboration, Panasonic and Tesla together have developed a next-generation battery cell based on this nickel chemistry, which is optimized for electric vehicle quality and life. “Panasonic will supply lithium ion cells for EVs that can achieve longer range with large energy density. It is our pleasure to start supplying the cells for Tesla’s Model S and promote sustainable mobility,” said Masato Ito, President of Panasonic's Energy Division. These new cells will combine with Tesla’s proven EV battery expertise gained from more than 15 million real-world customer miles driven in the Tesla Roadster. The thousands of hours of battery and cell testing give the company an advantage in producing and building their new car, the Model S. All the data gathered will enable to company to make the Model S the most capable electric vehicle ever produced. Tesla and Panasonic should enjoy a long and prosperous relationship, as the EV market continues to grow and more people are aware of these companies ground-breaking new technologies. Tesla is one of a handful of companies focused purely on developing electric vehicles. The company was started in 2003 and the name is derived from the famed electrical engineer, genius, and Edison rival, Nikola Tesla. Tesla is trying to make electric vehicles more desirable and viable for the car buying public. It controls the whole process from conception and vehicle design to customer delivery, thus creating a very high standard for product quality and customer satisfaction. Tesla has been selling the Roadster, a 2-seater supercar that can accelerate to 0-60mph in under 4 seconds, since 2008. They have built 1,800 Roadsters. Tesla will be expanding its vehicle lineup with the new Model S, the first luxury electric sedan to go on sale in the North American market. It should available to buy sometime in mid-2012, and Europe and Asia in late 2012. Tesla is also a supplier for electric vehicle powertrain components to the industry. The company supplies batteries and powertrains to Toyota and Daimler for their electric vehicles.